Award-winning mover in DC, VA, NC, SC, GA and FL. Hilldrup was founded in 1903 and operates nationwide with nine different locations including Washington DC, Charlotte NC, and Atlanta GA.
MovingScam.com decided to endorse Hilldrup Moving and Storage in June of 2012 due to the many good reviews posted on our forums, and because of the honorary mentions from the professionals who volunteer their time to consumers. Hilldrup has a long history of excellence in customer service going back several years. They have consistently won the United Van Lines’ “Customer Choice Award” for outstanding customer service since the award’s creation, an industry record 23 times, and won the AMSA “Moving and Storage Agent of the Year.” Because MovingScam.com places great emphasis on quality, it is important to note that a company representative told MovingScam.com that Hilldrup had 2080 claims in 2016 out of 19,101 booked moves. That would mean that of the total shipments booked by Hilldrup, claims were submitted for only 10.89% of them, a very good ratio. In addition, Hilldrup is DoD approved for military moves and holds an ISO 9001:2008 certification, which is the industry’s most comprehensive operations designation to ensure the highest level of quality and compliance. 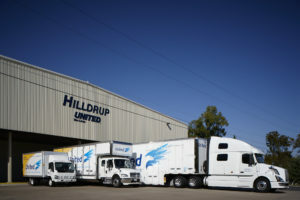 A family-owned moving and storage company, Hilldrup is one of the largest and the most honored agency groups for United Van Lines, America’s largest van-line. Their dedicated staff helps families, businesses, and government agencies relocate locally, throughout the United States and around the world. Since 1903, Hilldrup has focused on making moving simple for our customers. We offer local, long distance and international moving options for individuals, corporations and government agencies. Now in our fourth generation of family ownership, our commitment to quality and integrity remains our guiding principle. Hilldrup’s highly trained Move Counselors are available around the clock to answer all your questions. Our partnership with the world’s largest van line and our more than 1.25 million square feet of storage space give us the infrastructure to make good on our worry-free promise. At Hilldrup, we are committed to quality and customer service. While we don’t do this for awards and acclaim, we have been recognized as an industry leader along the way, including 23 United Van Lines Customer Choice Awards – an industry record. All of our customers receive complimentary moving tips, text updates, instructional videos, and online shipment tracking, available on http://www.Hilldrup.com. Need help getting started? Talk to one of our experts today about taking the first step on your journey. Don’t have time for an in-home estimate? We also offer video surveys. Schedule yours today!